Sandy Schenkat is next in my series of people who are following their passion and living their dream. 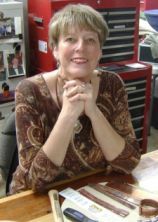 Sandy retired from a 30 year Real Estate career when she decided to help jewelry artists market their work. From this beginning, Sandy determined that she really wanted to create the jewelry designs too! She began with training from Luxe Jewels and eventually created jewelry with beads from Kenya. This line is called Kenya Kasuals. Two years later Sandy found her passion while working with Swarovski crystals! Her new designs are marketed as Heart and Soul Gems. Sandy was making lots of heart designs as well as using many of the chakra colors. Heart and Soul Gems was the natural outcome! What drives you to continue in the direction of your dream? Sandy LOVES jewelry and loves learning new techniques. The whole process from design to sales is so much fun! What successes would you like to share? What are your passions not related to your business? « Do you love Copper Cuffs? See my newest collection.